by CNN. December 5, 2010. Christians pray at the Sayidat al-Nejat Cathedral in central Baghdad on November 7, a week after 46 fellow worshippers taken hostage in the church by al Qaeda gunmen were massacred. Religiously rooted violence is causing increasing concern. Photo: CNN. BAGHDAD, Iraq (CNN) — Attackers gunned down an elderly Christian couple late Sunday inside their Baghdad home, the latest in a string of religious-rooted violence that has spurred international outcry and a full-court press for justice from Iraqi authorities. Hours earlier, Maj. Gen. Qassim Atta said in a press conference broadcast on state-run Iraqiya TV that 15 "Arabs" — in Iraq, a euphemism indicating they came from outside the country — were responsible for three deadly attacks in Baghdad in recent months, including a bloody church siege. The spokesman for the Iraqi military command in Baghdad showed pictures of each of the men, whom he called "terrorists" and said they had entered Iraq from unidentified countries between June and August. Ten of them had died while carrying out suicide attacks or had been killed by Iraqi security forces, Atta said. The other five remain at large, with Atta urging the public to help in tracking them down. "According to our intelligence information, four of the five terrorists are still in Iraq and one of them has fled to Syria," he said. While Atta did not immediately link Sunday's killings to the remaining suspects from the group of 15, he did tie the group to a deadly attack on a Christian church as well as two other incidents. The first of the three attacks happened August 17, when suicide bombers killed at least 48 people at a military recruitment center in the Bab al-Moudham commercial area of central Baghdad. On September 5, at least eight people died in a suicide bombing at a military base in that same area. 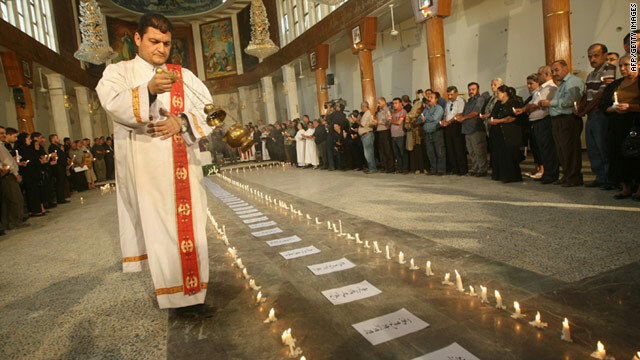 And the deadliest attack that Atta referred to occurred October 31 2010, when militants stormed the Sayidat al-Nejat Cathedral, or Our Lady of Salvation Church, in Baghdad. Some 70 people died and 75 others, including 51 congregants and two priests, were wounded. About a month later, Iraqi authorities announced they had arrested 12 people who had a role in either plotting or executing the operation. They included Huthaifa al-Batawi, described by Iraqi officials as the leader of the Islamic State of Iraq and the "mastermind, direct supervisor and planner" of the attack. That siege was among the first of many attacks in recent weeks targeting Christians, which have left scores dead and many more wounded throughout the Middle Eastern nation. While there have been a few larger scale operations, most were more like what happened Sunday evening, with gunfire or bombs targeting a few Christians at a time. While the issue has become more public in recent months, the threat has been real for years. Christians are among the religious minorities in a country dominated by Sunnis and Shiites, and tens of thousands have fled Iraq in recent years. The violence had led the United States, the United Nations Security Council and an American Catholic archbishop to express concerns for Christians and other religious groups in Iraq. Pope Benedict XVI said after the siege that he was praying "for the victims of this absurd violence, all the more ferocious in that it hit defenseless people gathered in the house of the Lord, which is home to reconciliation and love." Cardinal Emmanuel Delly III — the patriarch of Iraq's largest Christian community, the Chaldean Catholic Church — urged Iraqi Christians in a televised address last month to "stand firm" within their country during these "difficult times." On Sunday, Italian Foreign Minister Franco Frattini said that he pressed the need to protect Christians in conversations with Prime Minister Nouri al-Maliki, calling it an issue "of paramount interest for my country and for me personally." Frattini — who also met this week with survivors of the church siege, as well as Cardinal Delly — also said it was important that Christians felt secure in Iraq, and that they remained there. "We shouldn't tolerate Christians leaving Iraq," the Italian minister said. "If Christians leave, the terrorists and al Qaeda would have won." Al-Maliki gave "assurances" that those behind the violence would be "severely punished," according to the Italian cabinet minister, and that Christian leaders in Iraq would be kept up-to-date on key developments. Frattini also said the Iraqi prime minister told him that a Christian would head a new parliamentary committee looking into how best to safeguard security for members of this religious group. Iraqis are also mulling forming police units specifically charged with protecting Christians, according to the Italian foreign minister.